i’m taking a quick break from blogging about thanksgiving… for a recipe that will change any muggle’s life forever. it all started a month ago when my friend kristen introduced me to this website. i am now a daily reader. 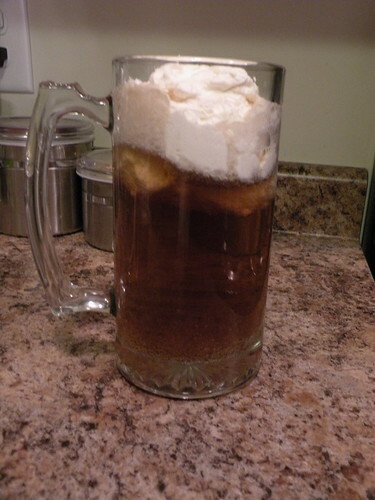 back up a few weeks ago, and they featured a butterbeer recipe from this blog, which i am also a big fan of! the only difficult part about this recipe is finding butter extract. i finally found it at wal-mart. if you’re unwilling to brave the deathly hallows of wal-mart, you can find it online here. buy a LOT of it, because you WILL become addicted to this magical drink in a stein. set out 6 16 oz. glasses. place 1/2 tsp of butter extract in each glass. pour 12 oz. of cream soda into each glass. lightly stir with a straw. in a large bowl, whip the heavy cream on medium high speed for 3-4 min. until it starts to thicken. add the sugar and continue whipping until very soft peaks begin to form, another 3-4 min. stir in the vanilla and butter extract, then whip for another 30 sec. or so, until soft peaks form. Sounds delicious! And, thanks for the shoutout! Miss you!